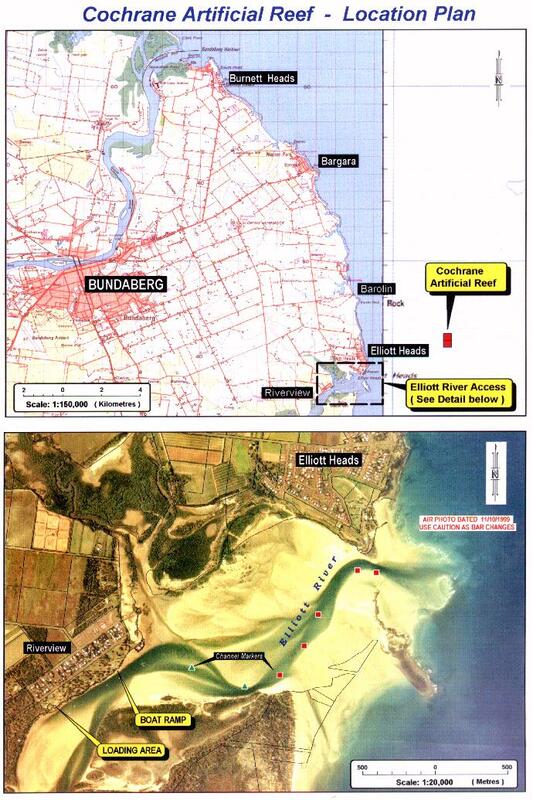 The Cochrane Artificial Reef can be accessed from either the Burnett River or the Elliott River. The trip from the Burnett takes a little longer, but because the Elliott has shallow water at low tide and a bar which can be tricky at times, the Burnett is sometimes a better option. Most of the smaller placements by the Artificial Reef Association are done from the Elliott River, because of the shorter trip out to the site. Larger objects such as the Lightships are usually towed into place from Burnett Heads. This is the Cochrane Artificial Reef Locality Map to show where the Cochrane Artificial Reef is located in relation to the Bundaberg area and coastline. The Multi-Beam Sonar Survey Map is the latest version of the Cochrane Artificial Reef map. It is the Multi-Beam Sonar Survey which was done by the Port of Brisbane Corporation in January 2009. It shows all objects deployed on the reef up to September 2008. The map is in colour, with the datum set in WGS. The map shows the position of objects that have been placed, gives the GPS readings of each object, and shows the depth of water above each object at minimum low water. The positions given are on the Australian Geodetic Datum of 1984 (AGD 84) and position format is in Degrees, Minutes and Decimal Seconds. Entering the positions in a GPS unit not set to this Datum and position format will result in a positional error of up to 200 metres.